Lice Clinics of AmericaGet The Wine Laugh or CryLice Again?! Join us on our journey! We are currently allowing all friends and family of LCA to invest in our equity crowdfunding campaign. CLICK HERE to invest now & learn more. When I found lice for the sixth time I wanted to scream into a pillow, but first I had to wash it! I asked my pediatrician for his best prevention advice? “Remain Childless,” he said with a straight face. Thanks a lot Dr. Dry Humor! In 2014 B.L. (Before Lice) during a more innocent era of parenthood, Pink Eye and Hand, Foot, Mouth Disease were my biggest worries. But no more! In 2015 A.L. (After Lice) when the big news story broke and that hideous map appeared on television screens, outlining the 25 states with Super Lice (California was highlighted!) I insisted my significant other leave work immediately and we list our house with a realtor. Wasn’t Oklahoma a nice place to raise a family?? But seriously, I’d been at the pharmacy purchasing over-the-counter Nit Kits so many times, the cashiers were donning gloves to ring me up. And since putting my kids up for adoption and moving out of state weren’t real options, I finally figured out how to handle this dicey err licey situation. Ready? Blend together four raspberries, 3 oz. vanilla yogurt, ¼ cup orange juice with three shots of vodka. Lather this concoction into your kid’s hair overnight and . . . I’m kidding — you drink it. You’ll need it! Until you contact Lice Clinics of America, like I finally did. The visit at our local clinic began with a really calm, extremely cheerful woman (Mary Poppins must’ve been released from her Disney contract?) who explained in great detail the simple procedure she would perform on my daughter. 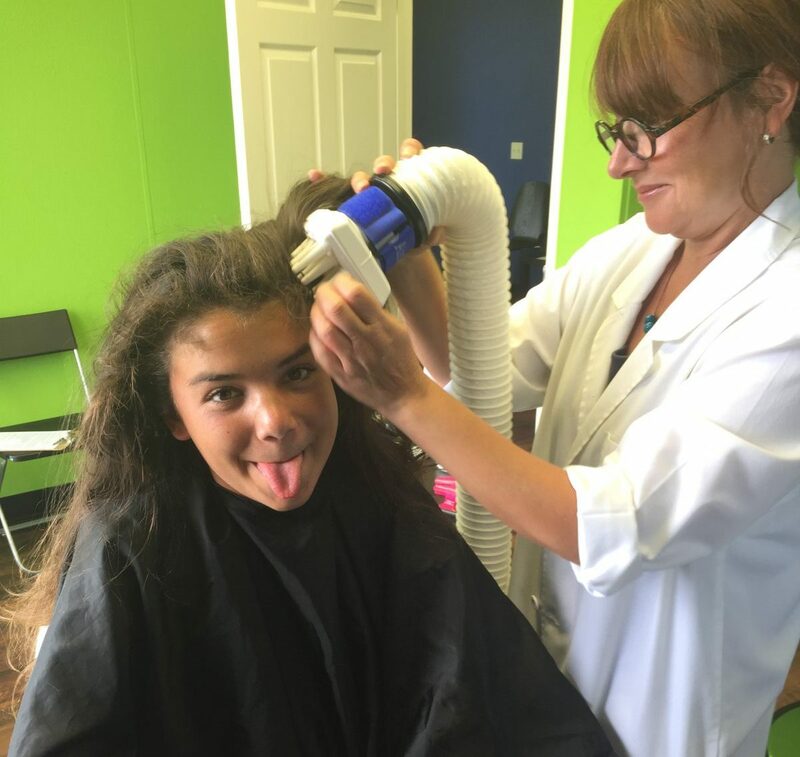 My girl was immediately intrigued by her own personal “Louse Buster” called the Air Allé, (pronounced air-a-lay) which is an FDA-cleared medical device that kills head lice and 99.2 percent of lice eggs in a single, one-hour treatment. It’s a revolutionary alternative without toxic pesticides, herbal remedies, or parasitic suffocation tactics, all of which will fail, by the way. This amazing machine, (which was invented by scientists at the University of Utah) works through a specific combination of temperature, airflow, time and technique. There was even a guarantee! I sat fascinated in my comfy chair while observing the hour-long process, as a pleasant timer gently dinged periodically, subliminally suggesting I go buy a Betty Crocker mix (And maybe I should bake something to commemorate our final demise of lice!) That’s how confident I was that this one single visit had taken care of our lice problem, at long last. During the short and easy post-treatment comb-out, I snapped a lot of photos of my smiling daughter to illustrate this article. She was so happy at how painless everything was that she announced she thinks she has a new career . . . as a Lice Salon Model. Oy, you’re still going to college, darling! Driving home, I gleefully phoned my other five children and told them to fire up the oven — not to burn the house down like I’d threatened on previous occasions after a lice infestation, but to bake a cake so we could celebrate. After all, this was the last time I would have to wash a load of nit-infested linens (with the dryer heat set to the equivalent of the temperature on the surface of Mercury) to kill these bionic bugs! Note: This blog post has been thoroughly treated by Lice Clinics of America and is guaranteed parasite-free — therefore there’s no need to fear downloading or sharing it with friends. So do pass it on and save someone’s sanity! If you are a member of the Lice Clinics of America network, you can access the resource portal here. Copyright © 2016 Lice Clinics of America. All rights reserved.